But for those of us with more options it makes sense, to me anyway, to opt for something that’s had time to mature and develop flavour. I love lamb, preferably one that’s had time to roam the fields and put on a bit of heft. But if I can lay my hands on some hogget or mutton, I’m a happy woman. For the record, lamb refers to an animal under a year old, hogget is between one and two years and mutton over two. In spite of the efforts in the UK of the Mutton Renaissance campaign, hogget and mutton can be hard to source. I’m fortunate, living in Suffolk, in having a butcher like Salter and King who will not only alert me when they have some, but will deliver it. The meat came from Alan Peck who farms at Erpingham in Norfolk. I may have got a bit carried away with my online ordering so expect rather a lot of hogget and mutton recipes in the coming weeks. If you can’t source any, don’t despair, because the recipes will still work for lamb, you may just need to adjust the cooking times. 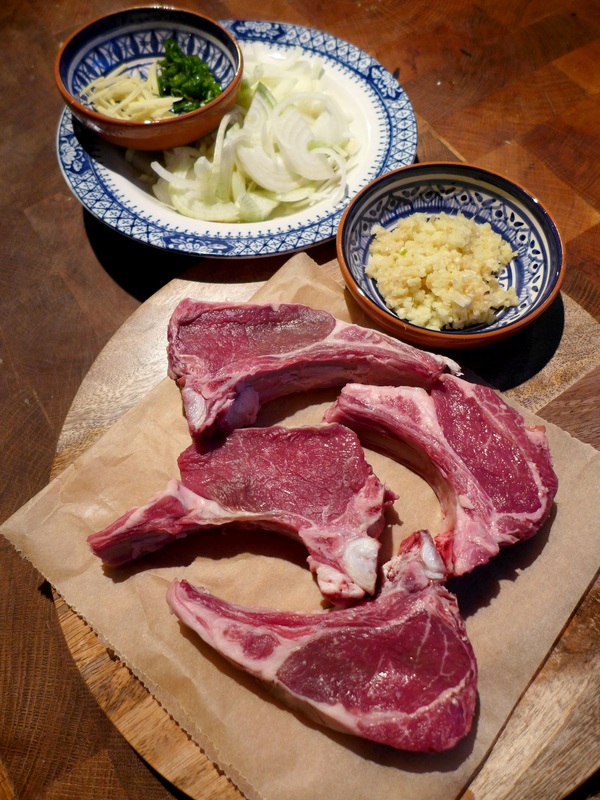 This recipe is for mutton chops, or cutlets, cut from the loin. There are two ways to go with these – fast and hot or low and slow. I couldn’t resist the lure of Indian spices so mine were gently simmered for an hour or more, producing tender, flavoursome meat in an aromatic but fairly dry sauce. I served them with naan and a simple potato and pea curry to cater for my spud-loving husband, but rice would work just as well. A raita or chutney would be good on the side. Trim the chops of any excess fat. Put a deep frying pan, one with a lid, on a high heat. Add the oil and once it’s sizzling, quickly brown the chops for about a minute a side. Remove and set aside. Turn the heat to medium and fry the onions until they’re a deep golden brown. Add the spices, garlic and ginger and fry for a couple of minutes more. Pour in the tomato passata, stir and cook for a further five minutes. Add the water, stir well and put the chops back in the pan. Cover and cook on a low heat for an hour to an hour and a half, or until the chops are tender. Keep an eye on the liquid levels and top up with a little more water if it looks as though it will catch, but don’t water it down too much. The sauce should cook down to about a cupful of something thick, rich and dark red. Remove to warmed plates and garnish with the chilli and ginger. 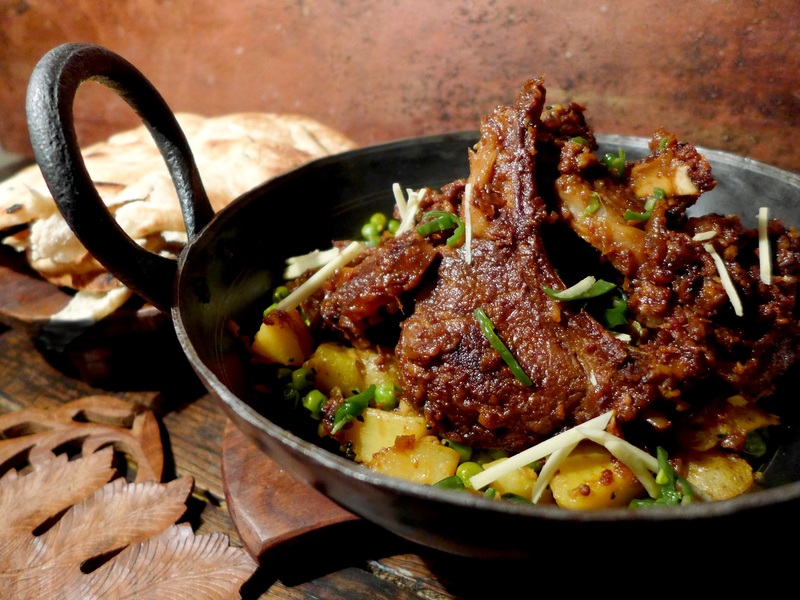 This entry was posted in Lamb and kid, Mains and tagged hogget and mutton, mutton chops indian style, mutton chops masala by Linda Duffin. Bookmark the permalink. Oh my. That looks absolutely fantastic! We used to get mutton from a farm in Wisconsin and I love mutton, as well as all the lamb I can get! And I happen to have a brand new tin of Garam Masala in the cupboard!! Absolutely love the gamier taste of mutton but at least my part of Australia is largely lamb country. As Asian spices are rarely out of my hands have purloined your recipe onto my kitchen pile already tho’ the ingredients may be bathing the hogget I can get . . . like the relative ‘softness’ of the Kashmiri chilli powder combined with the passata also . . .
Oh, those look so delicious. It’s funny that Kentucky is a huge mutton BBQ state (the story, possibly apocryphal, is that it had to do with Welsh farmers settling in the western part of the state back in the day). And, yet, you can’t find any mutton here to buy on a retail level.